From this CAD image the titanium exhaust and the V4’s position in the frame can be seen. Also highlighted is the high-end forks and braking set-up. 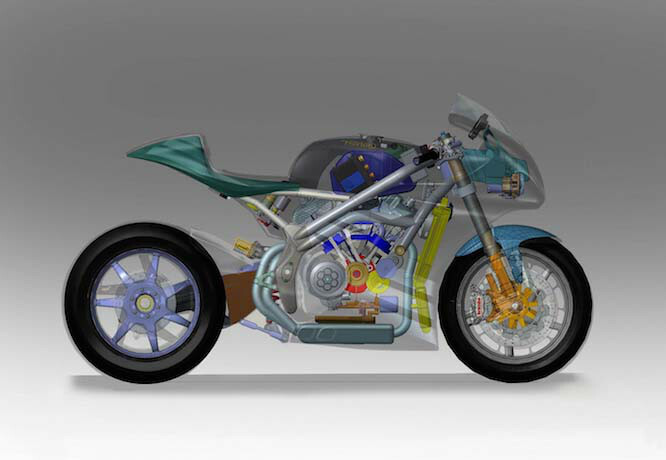 After receiving £4 million of government funding in July of this year Norton has revealed detailed sketches of its superbike aimed directly at Ducati’s Panigale to UK website Bike Social. The bike, set to be powered by a 1200cc V4 engine developed by Ricardo Motorcycles, will follow a similar recipe to Norton’s Isle of Man TT race bike, meaning over 200 horsepower and an in-house designed and built billet alloy frame. The ‘SG3’ TT bike, while powered by an Aprillia RSV4 sourced engine, uses a hand built Norton frame which has contributed to the bike being described as a difficult beast to handle according to Australian rider Cameron Donald. While it hasn’t had as much success as the English marque had hoped for, developing a race bike from scratch has been far more difficult that adapting a proven road based model like the larger teams have been able to do. On the cards since the English manufacturer’s re-birth in 2008, the new ‘road focused’ (if you could call it that) superbike has been made possible by the recent government funding injection and will begin to gather pace in December. 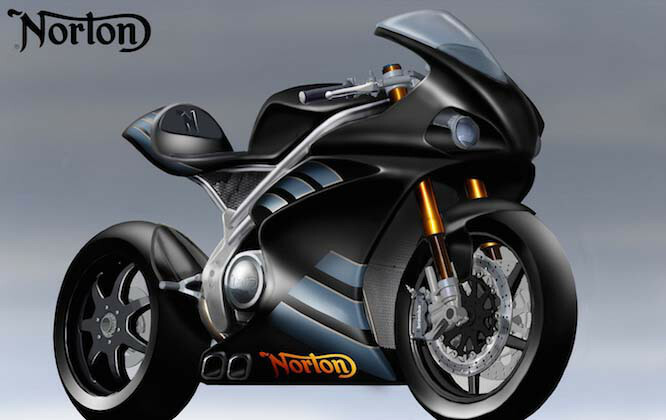 Norton’s head of design told Bike Social that the bike will feature electronic rider aids, carbon fibre wheels and bodywork and will produce over 200 horsepower, with a focus on ride-ability and engine character. Like the SG3 the frame will be made from hand-welded billet alloy with a polished finish; also carried over from the race bike will be the extensive use of titanium in the exhaust system and Ohlins suspension components. All of this won’t come cheap, as you’d expect, with Norton aiming to produce three spec’ levels with prices set to start in the mid-to-high £20,000 mark and continue up from there.